While the mice are away, the cat will do stuff! After that was taken care of, I went outside with Leif and Heidi and scraped a bunch of lichen off of branches that had fallen in the woods. Why would I spend my time doing something so seemingly pointless, you ask? 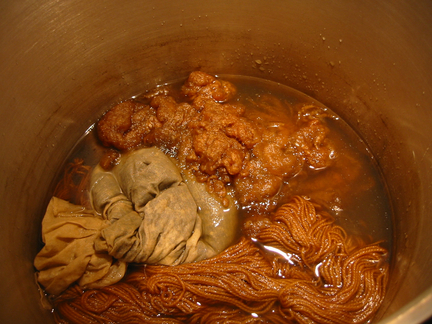 Well, because when you boil this funny little plant, it creates a wonderful rusty brown color to dye fiber with. I have two skeins of white alpaca/wool mix that I want to use to make this vest for Leif. So, I thought I’d make it a more seasonal color first. We soaked our fiber in hot water while bringing the Lichen to a boil (we ended up having about 4 cups of lichen and wrapped this in muslin cloth before putting it in about 2 gallons of water). I had 2 skeins weighing about 7 ounces and Heidi had about an ounce of unspun wool. 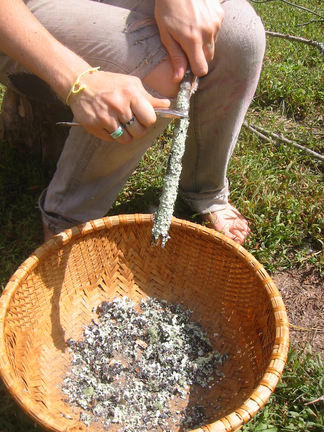 The rule of thumb when using lichen is 2:1 lichen:wool. We ended up using 4 cups (I don’t know the weight) of lichen to 8 ounces of wool. If we had gone by weight I’m sure the color would have been stronger. The lichen boiled for 30 minutes, then we turned it down to simmer for an hour and added 2 big pinches of salt (to help the dye set). 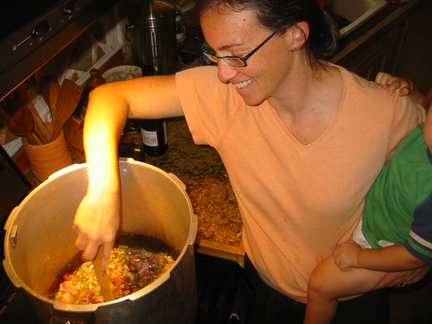 Then we tosses the fiber into the pot and let it simmer for a few hours. Once the heat was turned off, it was left to sit overnight. While all this stuff was boiling, I decided it was time to reorganize my art closet. It had become a huge clutter … and I don’t like clutter. So, once Leif was down for his nap, I dove in. 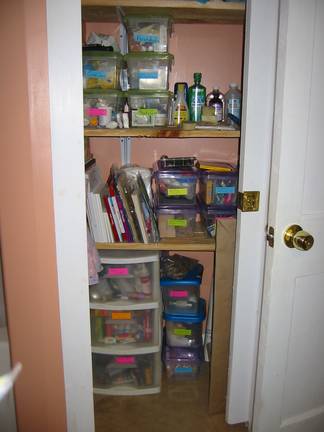 I even had enough boxes to organize our medicine section of the closet. I know I didn’t include the before picture, but believe me, it looks much better! 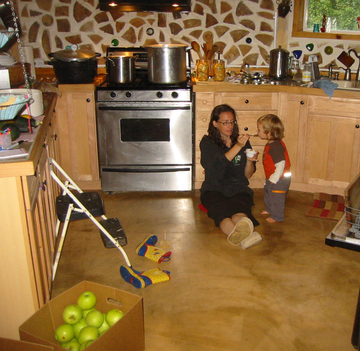 Leif was very helpful with my projects as long as I kept him supplied with crackers and apple cider (the non-alcoholic kind!) 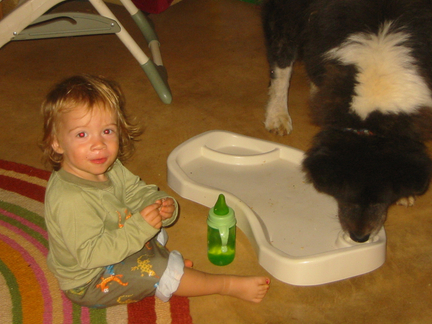 He even let Suki clean up after him. 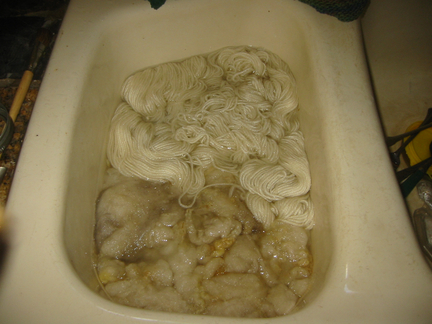 Saturday, I drained the fiber and rinsed it in warm water. It came out a nice earthy brown color. Heidi took her wool out, but I wanted a bit of yellow in there, too. 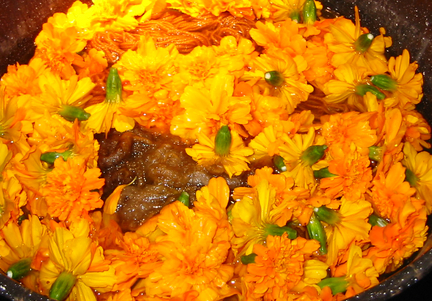 So, we decided to do a second dye with marigolds. 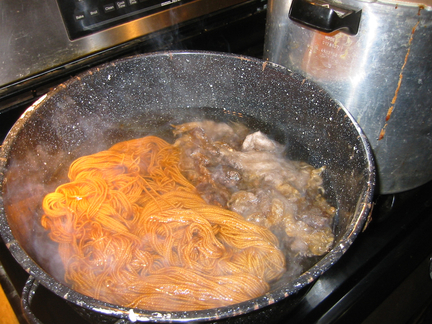 First we needed to boil the wool in Alum (Alum is used a lot in dying as a mordant, or a chemical that is added to the dye to make the color stay in the fiber). We stirred 2 ounces of Alum into about 2 gallons of water. 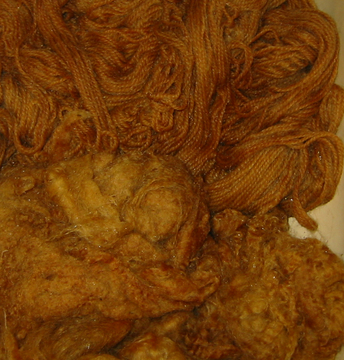 (We were using ~10 ounces of fiber, my two skeins of yarn and Heidi added more undyed wool. 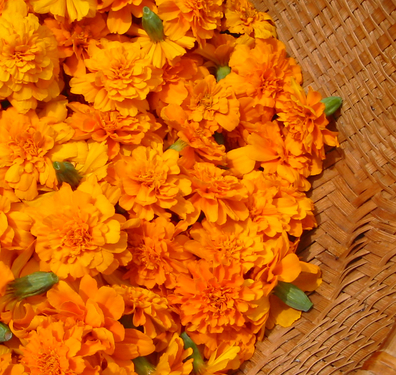 The general rule is 3 ounces of alum and 1 ounce of cream of tartar per one pound of wool, but Marigold doesn’t need cream of tartar.) 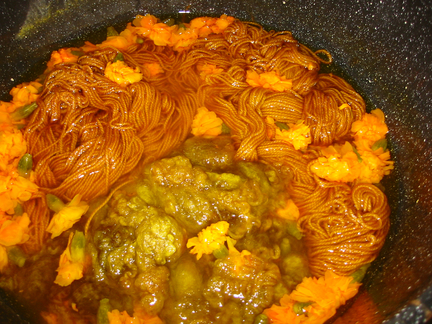 Then we tossed in the fiber and brought it to a simmer for one hour, stirring occasionally. (yeah… so, I’m not so good a measuring out everything… but if you want to, the general rule when it’s not Lichen is 1 pound of plant/dye material per one pound of fiber) and let it simmer for a few hours, until I got the color I wanted. Sunday I rinsed and dried my yarn. It came out perfectly! Just the color I had envisioned in my mind. I think it looks like pumpkin pie. It will make a lovely ‘little man vest”! With that out of the way, it was time to tackle some of those apples. So, I peeled and sliced up a bunch and tossed them in a pot to make cinnamon apple sauce (17 pints), apple pie filling (6 quarts) and dehydrated apples. And I still have about a bushel of apples left! Shesh! Got any good apple recipes? I think I’m going to go put my feet up! « Fall Bonfire and Chocolate Awesomeness! Great pics! The yarn looks AWESOME! Love the yarn dyeing! Turned out beautiful and perfect for a little vest. 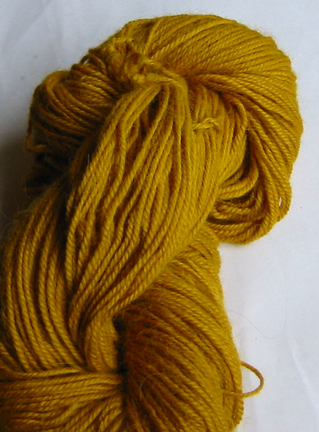 The colour of the wool is just beautiful – love it! Looking forward to seeing the vest. Super Maria strikes again! You are awesome lady, I bow down to your productivity! The yarn is beautiful, I’m glad your dye job was successful. I’ve done a little natural dying, but it didn’t work out so well. 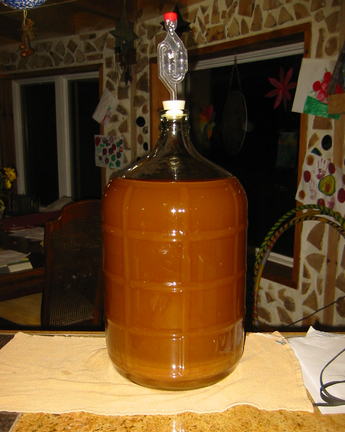 The hard cider sounds awesome, maybe next year for me. Look at that boy grow! I’m pretty new to your blog, but really enjoyed this post. I had a question about th soup you canned. Did you can it without the dairy? Please advise. I have 50# of potatoes ordered some of which I hope to can as soup but I wasn’t sure about putting milk in it. I had just planned to add the mild when I cooked/served it. (Pressure canned of course.) Thanks for your guidance – the recipe looks great! See, *this* is one reason why you’re awesome! I completely understand this kind of day, and I’m excited to have spent it vicariously with you! Thanks for all the tidbits. Really, we should have a project day together sometime.